we’re a culture, not a costume? We love dressing up…or down. And most of us love dressing up in our costumes for Halloween. Heck, we actually spend $310 million dollars/year on costumes…for our pets. Wow. In total, Americans spend between $6.5 – $6.86 billion dollars on all things Halloween: costumes, candy, and decoration. Wowzers. The average consumer is projected to spend $26.52 on costumes. The holiday will see Americans spend $1 billion on children’s costumes, up from $840 million last year, and $1.21 billion on adult costumes, up from $990 million last year. Additionally, pet owners will shell out $310 million on costumes for their four-legged friends. And while I don’t personally go ga-ga over my costumes, I love seeing the creativity at costume parties. But several years ago, the laughing kinda stopped because at nearly every single party (even at church parties), I’d see a costume or two that were either borderline or straight up racist. Perhaps, you’ve seen them, too. Perhaps, you thought they weren’t a big deal. Perhaps, you thought they were funny. Perhaps, like me, you were offended. What I try to convey to people is that despite their “best intentions,” these costumes really are not funny. It’s like this: You might think it’s funny, but my slanted Asian eyes are beautiful – not to be mocked. My point is that we never allow the conversation to get deeper because eventually, the attention or responsibility is deflected upon the ‘other’ person. Or perhaps, the best way to diffuse these tense but awkward conversations are to mock it or altogether, change it. Then came the realization that their original message was getting lost in the mockery, she said. The most startling was an image of a monkey holding a picture of the black student featured in the original poster, she said. Next Thanksgiving and Genocide? Let’s write and share a more honest story. Love the campaign. Thanks for sharing it. I am glad that students are making waves around this topic, esp. in Ohio. Grew up there and wish this kind of conversation went on at my school when i was in college. … small thing though. Hope you edit your comments, you don’t have to publish this… It was started at Ohio University, not Ohio State. OU is much smaller, much lesser known, and out in the hills, which makes their appearance in the national dialogue even more awesome in my opinion… sending this comment with admiration for your work and writing. Thanks Abby for the comment and the correction about Ohio U. You’re right – even more impressive. After I wrote my own essay at Provoketive, http://provoketive.com/2011/10/29/we-are-a-culture-not-a-costume/, I thought “what do I know, being a white person?” But we need to speak out as much as anyone I think as we are most of the times the ones who so thoughtlessly perpetuate racism. Tonight I was out at a costume party and two white people were dressed up as Harlem Globe Trotters, wearing enormous Afro wigs. I definitely saw them differently than I might have at one time and after thinking so much about this of late. Why do we need to turn others in the caricatures when there are so many imaginative and fun costumes out there — like dressing up as your husband. Loved that! i wonder myself since the globetrotters and their uniforms were in itself – costumes. I suppose it would be OK to dress up as “The Reds” … of course they’re supposed to be mocked right? Eugene – Thanks for highlighting this. I wasn’t aware that people were mocking this movement by ‘shopping the original images, but I’m not surprised. As you said, “My point is that we never allow the conversation to get deeper beyond…the costume or attention or responsibility is deflected upon the ‘other’ person.” Unfortunately, this cycle is all too familiar: racially offensive incident / response / overwhelming backlash. Even in “harmless fun,” like Halloween costumes that mock or degrade a culture, ethnicity, or people, we need voices like yours. Thanks for sharing. I love the picture of you and your wife. 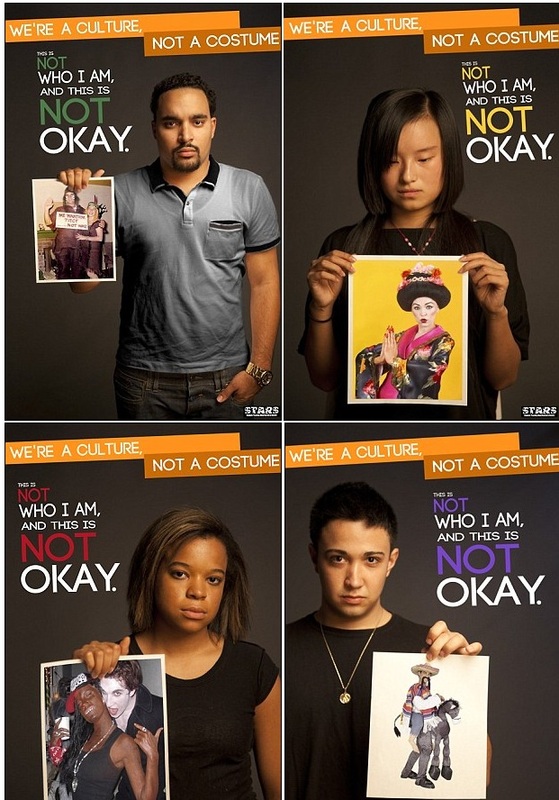 I am glad the Ohio students began addressing the costume concern with these posters. I’m trying to decide if I saw someone wearing a Czech kroj (native costume) who was not Czech and had their hair/make-up done to look Czech if I’d be offended. I’m not sure. I know it would be somewhat of a mockery – they would probably have a beer in one hand and a crucifix in the other. I’m just not sure how I would react. If they added a bad accent and walked around saying “kiss me you little goose” or “the cat goes through the whole in the wall and the dog through the window” – loose translations of popular phrases, how would I feel? I don’t know. I think I would be more offended by someone who was not a Christian dressing to impersonate a Christian, because I would consider this an intentional mockery, not a naiive imitation. A friend of mine who is an immigrant to our country thought it would be neat to dress her children up in “Indian” costumes to go to the Native American museum. She thought she was being respectful. I wonder how much intention matters in these discussions. I think more cases than not, our intentions aren’t to harm or offend; certainly not to be racist so i would say that intentions have a space in the discussions but NOT the final say. It is imperative that educators and parents teach cultural respect and self esteem to every child in America. It is unfortunate that those virtus are not widely instinctive in mankind. These values must be taught. I almost dressed Christian (my 13 month old) up as a tribal Samoan with fake tattoos and a loin cloth but I thought it would be too cold. Since I’m half Samoan I was thinking it’d be cute to see him looking like a baby warrior. Maybe because Samoans as an entire culture aren’t typically mocked or stereotyped in a derogatory way I wouldn’t be offended to see someone dressed up as a fire throwing, tattooed Samoan – but I wouldn’t dare think of dressing up as a culture that has a long history of oppression, prejudiced discrimination or anything close to it. It brings up too many hurtful suggestions and has a particularly cruel sting because people shrug it off as being just a joke. Thank you Eugene for sharing this. Some costumes are extremely racist and offensive. I hate Halloween all together, but that is a different topic. I think issue here is just a reflection of the bigger picture, and that is how the media, movies, etc still in some circles portrays various cultures. My wife dressed up as an Indian woman (from India). No, she didn’t color her skin, but drew henna-style tattoo on her hand, wore beautiful, authentic-looking jewelry, and put a dot of something shiny on her forehead. She took care in looking the part, and I think she represented a beautiful culture with gorgeous traditions. She was actually concerned that she was doing the wrong thing after she saw these Culture-Not-Costume ads. I thought she was beautiful and she wasn’t aiming for laughs, but for authenticity as best she could with what we had at home. Is this wrong? Or is it wrong only if the costume garners laughs? Brandon: I guess this is where people have varying opinions. If you asked 100 Indian women (and men) and asked for their thoughts about a random White woman dressing up as an Indian woman (however beautiful) during Halloween, I wonder what they would say and feel. Granted, not everyone may feel a certain way but I wonder how that would impact our decisions to wear what we wear. What if they thought she was beautiful, too? Thanks for your honesty here. It is entirely understandable why the culture of costumes can be hurtful if not downright offensive. Not to mention that costumes will often highlight the elements of a culture that can be caricatured rather than celebrated. What if next year, everyone dressed up as themselves? Or at least who they would want to be. I’d definitely have bigger bicepts. I know this is a mad old article. But, here is my two cents. I am offended when I see a clown costume, I am offended on Saint Patrick’s Day every year, I am offended when people talk about potatoes, paddy wagons, Irish cops, or wear kiss me I am Irish shirts. All of these celebrations and everyday things, are a testament to stereotypes of the Irish. I don’t want to see clowns, I don’t want to hear paddy wagons, and I am certain that I don’t want people going out on St. Pat’s if they can’t name the 32 counties. I agree people are ignorant, and don’t mean it to be stereotypical. That is why I let it go, because my people helped set-up the Big Apple Circus and it ain’t moving. When we are all together on banning clowns, that is when I will agree with this message.